On 21st September, St Mary’s church at Chadwell was open to visitors. 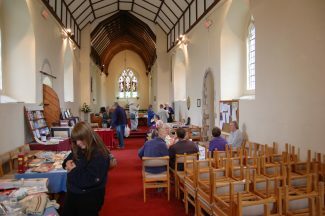 This was a rare chance to see inside the church. 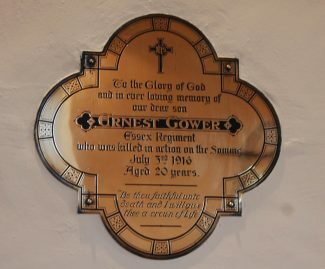 Features within the church include a memorial brass to Cicely Owen from the early 17th century. There is also a memorial to the son of a local farmer – twenty year old Ernest Gower – who was killed on the Somme in 1916. Among the other interesting features are two scratch dials. These are on the south wall, which was once the outside wall, but is now inside following an extension at the start of the 20th century. A stick was inserted in the hole and the shadow showed whether it was time for a particular service. 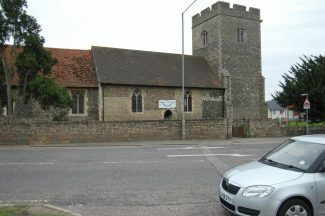 It has been described as the oldest clock in Chadwell. At the eastern end of the church, on the north side, is a stained glass window dedicated to William and John Philip Herrinham who were rectors of Chadwell in the late 18th and into the 19th century.